Join us May 19 at 3 pm in The Gallery Meet Steven Kellogg author and illustrator of so many children's classics, including Pinkerton, The Day Jimmy's Boa Ate the Wash, The Mysterious Tadpole, Is You Mama a Llama?, and Snowflakes Fall. Steven will be the author in residence at Simonds School earlier in the day. This is a rare opportunity to meet one of our finest in children's literature. We invite you to join us for another wonderful program, part of our observance of Black History Month. Our guest is a brilliant and distinctive new voice in American fiction, Margaret Wrinkle A native of Birmingham, she is the author of Wash, a critically acclaimed book that takes readers on an unforgettable journey across continents and through time. Wash is the name of a young man in the Revolutionary War era, the first member of his family born into slavery, who seeks to understand his time and place with the help of a potent healer named Pallas. Critics call this a luminous novel that is heart-rending in its depiction of the inhumanities of slavery and yet triumphant in its recounting of the lives of its survivors. 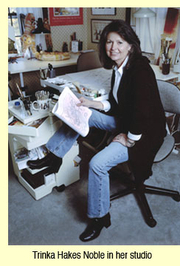 Trinka Hakes Noble is the award-winning author of numerous picture books including The Orange Shoes, The Scarlet Stockings Spy, The Last Brother, and The Legend of the Cape May Diamond. Ms. Noble also wrote the ever-popular Jimmy's Boa series and Meanwhile Back at the Ranch, both featured on PBS's Reading Rainbow. Trinka Hakes Noble is currently considered a "single author." If one or more works are by a distinct, homonymous authors, go ahead and split the author. Trinka Hakes Noble is composed of 9 names. You can examine and separate out names.